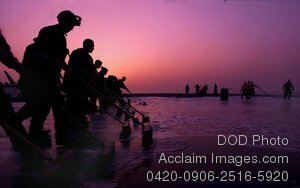 Description: Free, public domain image: Sailors Cleaning the Flight Deck of Aircraft Carrier USS Harry Truman. PERSIAN GULF (April 15, 2008) Air department Sailors push soapy brooms across the flight deck of the Nimitz-class aircraft carrier USS Harry S. Truman (CVN 75) during an evening scrub exercise. Truman is deployed supporting maritime security operations. Official U.S. Navy photo by Mass Communication Specialist 3rd Class Patrick Grieco.